My dream-come-true medicine cabinet would be filled with bottles and bottles of serums that treated every single skin ailment, from dryness to dullness; from wrinkles to hyperpigmentation. I am on my way to building a sizeable collection, but I am far from my ideal serum collection. 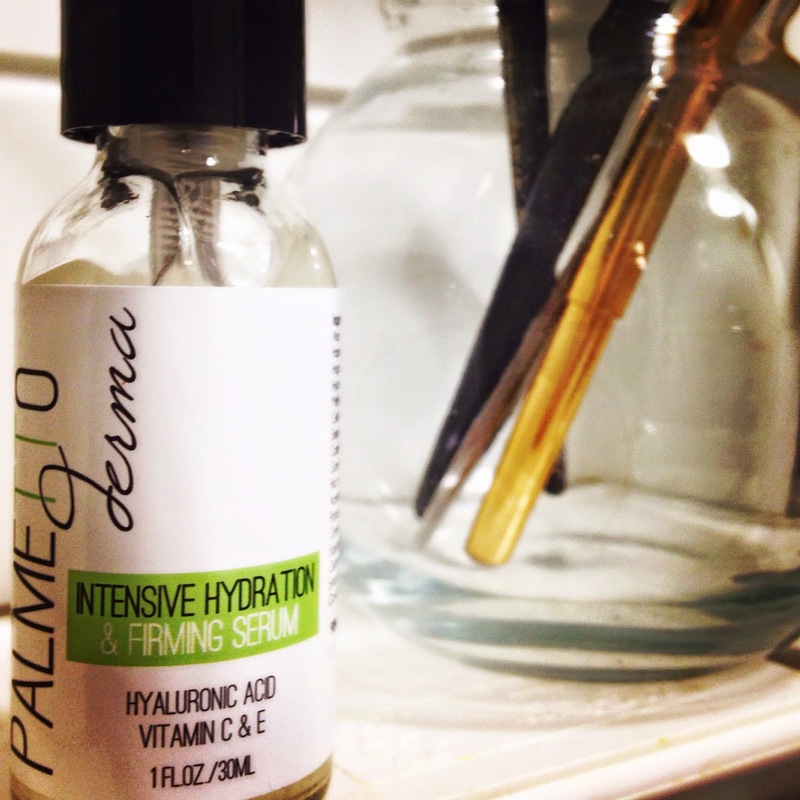 My latest serum addition and obsession is Palmetto Derma’s Hydrating and Firming Serum. Palmetto Derma is an up-and-coming, cruelty-free, and certified-organic skincare line. That’s not all -- all of Palmetto Derma’s products are paraben-free, sulfate-free, and alcohol-free, and so it really is a skincare line that can be used by any gender, and all skin types, including the most sensitive skin. (yay! ::happy dance::) Palmetto Derma also takes pride in being a brand that is more than skin deep. They donate 1% of all profits to Breast Cancer Awareness. Did it work? Did I like it? For the past few weeks, Southern California, and particularly, Orange County, has been experiencing a heat wave, and our daily highs have reached the mid 90s. Dry, high heat wreaks havoc on my skin, leaving it tight, irritated, red and flakey. BUT!! Since I started slathering on the Intensive Hydration Serum onto my face after I shower, my skin has not felt a hint of dryness. The Hydration Serum has been my go-to serum, and I’ve been reaching for it over many of my favorite serums and oils. In fact, since I have been using it my skin feels continually cool and smooth. It has not even caused one breakout or irritation, which I believe is attributive to the exclusion of alcohol and sulfate (both ingredients cause skin to be excessively stripped). The Palmetto Derma serum also has a light, silky texture that glides onto and absorbs into your skin easily. I prefer gel-like serums as opposed to cream serums because gel serums seem to absorb quicker and better. This serum is SUPER hydrating because of the hyaluronic acid. According to the Palmetto Derma website, “Hyaluronic acid is one of the most effective moisturizing agents, as it holds up to 1000 times it's weight in water.” No doubt, hyaluronic acid is a moisture surge, and one of my favorite ingredients (which I first discovered in Cerave’s PM Moisturizer). The serum has other great ingredients, too, like aloe, green tea, and jojoba oil (to name a few). So, if this Summer heat is leaving your skin dry and dull, and if you’re looking to firm up and moisten your skin, Palmetto Derma is a great serum to use day and night. This is definitely a God-send for combination skin people like me! Purchase yours at palmettoderma.com for $38. Receive 15% off your entire order with my special promo code “mshealthyface1”!